Fans attending the Golden State Warriors vs. San Antonio Spurs game at Oracle Arena in Oakland on Saturday were in for some seriously immersive advertising at halftime. 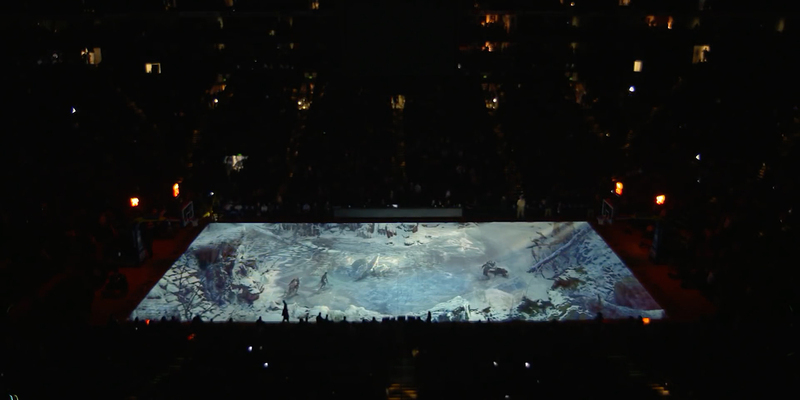 A special tarp was pulled across the court, the lights went down, and a two-minute video for the video game God of War was projection-mapped on the court, with part of the story told on the Jumbotron above—all courtesy of PlayStation and agency BBH. The experience was dubbed “War on the Floor,” and that’s just what it depicted: The floor of Oracle Arena suddenly became a snowy Nordic landscape, and the game’s father and son duo, Kratos and Atreus, were seen battling the elements as well as monstrous foes that put the visiting Spurs players to shame. NBA arenas have become high-tech meccas in recent years, but BBH still called “War on the Floor” a first-of-its-kind experience. And it was quite the collaboration—BBH and PlayStation worked with projection company Quince Imaging, game developer Santa Monica Studio and post-production company Platige Image on the high-profile project. The experience was simulcast on Facebook Live, and 30 seconds of it aired as a commercial on ESPN.